St. Patrick’s Day is coming – Irish festival celebrated on 17th March. It is high time to make a Leprechaun hat. This one is not for putting on a head, but it can be used as a container to collect students' works or a decoration of the classroom. Use a bin as a side band of the hat and green hard paper to make a brim of the hat. Remember to cut tabs on the inside edge of the brim to attach the brim to the side band / the bin with a double side tape. Then twist green crepe paper round the bin and attach a crown of the hat made with green hard paper. Finally decorate the Leprechaun hat taping a bond. 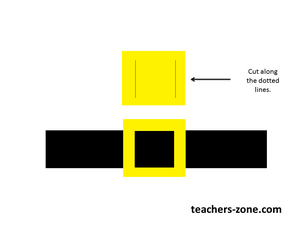 Make it with a black stripe of hard paper and a yellow square. Start teaching about St. Patrick’s Day with the Leprechaun hat and use it during the lessons in March.